A few years ago I was lucky enough to spend Thanksgiving week in Paris. It was magical. We celebrated our daughter’s seventh birthday, took in the Eiffel Tower from every imaginable angle and ate our weight in bread, cheese and pastries. The city was already decked in its holiday finest one night when we stumbled on an outdoor Christmas market. White tents adorned with twinkling white lights and filled with holiday gifts and treats – from fine chocolates to roasted chestnuts – lined the street. It was there in the cold and dark that I first tasted Mulled Red Wine or Vin Chaud (hot wine) in French. It was warm and spicy and just what the doctor ordered on a cold, windy Paris night. The first sip was bracing. I wasn’t used to the big, bold flavor of red wine steeped with spices and steaming hot, but a few sips in Mulled Red Wine or Vin Chaud and I were best buddies. I started playing around with my own version as soon I my family and I were stateside once again. The goal – to have the spice complement the red wine, not overpower it. This mix of cinnamon sticks, fresh ginger, star anise, cloves, fennel and peppercorns hits just the right spot. 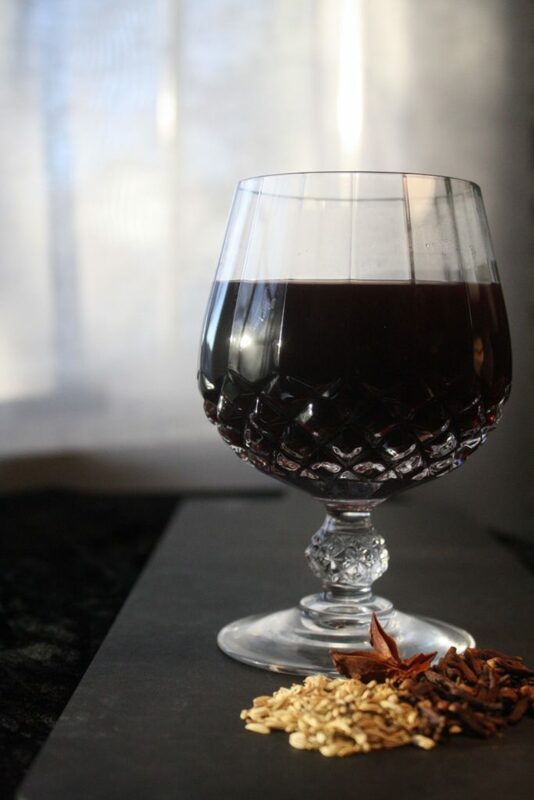 Keep a few things in mind when you make your own Mulled Red Wine or Vin Chaud. First, don’t let the wine come to a boil – simmer is your friend – or it can become bitter. Use whole spices instead of ground; they’re more flavorful. Strain them away before serving. Don’t be put off by the star anise. Its trademark black licorice-y flavor blends so well with the other flavors you won’t be able to pick it out. Mulled Red Wine or Vin Chaud is the perfect winter party drink. Double the recipe and make it in your slow cooker. Set out a ladle and cups and you’re ready to get your party started! Stir all ingredients together in a medium sauce pot over medium high heat. Bring to a simmer and continue simmering for 10 minutes. Stir all ingredients together in slow cooker. Heat on high for 30 minutes then reduce heat to warm to keep wine warm for serving.